On Saturday 23rd July 2016 Independent Left held a national members’ meeting to discuss current issues and the possible changes in direction of the group in response to changes in PCS issues that are, new, current and ongoing. As part of that endeavour it is important that we know more about this organisation. We can, of course, review their website https://diem25.org/ as part of our continuing understanding and exploration of the organisation. 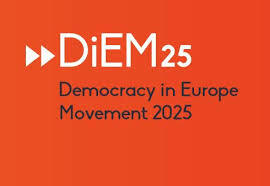 As it is currently formulated, and it is clearly open to change and growth through debate and discussion, DiEM25 is a Europe wide democratising force with an anti austerity agenda. It has many people, such as Yanis Varoufakis, involved in offering a high level of critical analysis of the EU and its institutions. Others already involved and offering critical comment are Brian Eno, Ken Loach, Saskia Sassen, Noam Chomsky. Diem25 have already offered their view on BREXIT stating it is “being radically indifferent to the wider world” !! Most of these critics come from many differing groups across Europe of many differing political persuasions, some from even further afield. Stuart Holland, previously a UK Labour MP, has offered some substantial comment on democratising Europe (http://www.spokesmanbooks.com/Spokesman/PDF/132Holland.pdf) and this link provides an insight into his views on the launch of DiEM25. The consequence of these criticisms is that, as seen in Britain with its BREXIT vote, Europeans are losing regard for the current EU set up. However, rather than running away and choosing an isolationist standing our fellow Europeans have established the beginnings of a movement that rejects the neo-liberal, corporatist agenda that has been pursued for an unhealthily long period of time. They have chosen to believe in a future, their future, and by default our future and by so doing reject xenophobia and the offensive nationalism that is seen in such responses as the Little Englander BREXIT vote. Despite its concerns it is moving forward and is currently establishing its organising principles. Unlike other European organisations aligned with the EU, DiEM25 invites comments and observations on its draft of organising principles as laid out at https://diem25.org/draft-of-diem25-organising-principles/. This means that should Independent Left consider active engagement, and it is more than capable of offering a detailed analysis of its own of the general thrust of these principles, then PCS IL would be in at the beginning of a developing and democratising force, not just in the UK, but in conjunction with Europe. Many people in the UK and across Europe can only watch documentaries to review how Europe was in the 1920ʼs and 1930ʼs and the catastrophe that was World War 2. They cannot fully imagine, I would assume, the horrors, both political and personal visited upon the people of Europe. DiEM25 want to stop the corporatist approach of the current EU bureaucracy which they say is causing a drift back to a Europe rendolent of the 1930ʼs with all of those horrors revisited, should we fail to act. They propose democracy as the way forward, NOT, the EU “democracy” as seen offered to the people of Greece when electing Syriza, but the actual democracy allowing the people of Europe a say in their future rather than voting to have MEPʼs but having no control of the EU Commission, or The European Central Bank. PCS IL has always been, and should continue to be, interested in ideas. So lets see what the ideas from DiEM25 generate in the form of debate for our UK futures. We should read and review their manifesto, only then can we decide whether it offers something for the aspirations and desires for our future as PCS Independent Left. DiEM25 appears to be a huge Pan European version of the more local Momentum group (a Labour Left caucus that supports Jeremy Corbyn’s leadership of the Party). It is driven by similar dissatisfaction with the incumbent political hierarchy and their modes of conduct. It is seeking a more open and transparent attitude to political conduct. Whilst seeking active participation from its membership. To clarify this you can see the Organising Principles Articles 4-6 where the meat of its objectives intersect potentially with IL. It is now active in eleven European countries and it is developing a different identifiable agenda removed from the usual or current political activities. It has been set up with a structure that, for the present at least, allows itself to be very nimble in the way it responds to immediate and current issues that have a major, or political, perspective. While the PCS Independent Left has the desire and ability to lead the PCS out of the cul de sac that it has found itself in in recent years, we must consider not only the domestic requirements that will beset any Trades Union organisation. We should also have our International Socialist agenda clear and for all to see in the relationships and alliances we make. This is to ensure that not only in the UK , but also in Europe, PCS IL can see, not just the domestic picture that will affect our members, but also we are aware of, and alive to, a wider political arena that will clearly also impact upon the lives of our members. DiEM25 may be just such an organisation offering a wider perspective to assist our IL membership and our PCS members. It has the potential to help develop both a local and international understanding of the politics that drive the decisions of government(s) for whom we work and come into contact with in our work.